The best place to see this is on the dedicated vascular neuroembryology page. For the abbreviated version — as soon as beast had a telencephalon, way before the PCA and MCA, it had its own ACA. The oldest part of the cerebral cortex is the olfactory lobe — all three layers of it, up in the front of head, and fed by the ACA homolog. The early ICA consists of two trunks — rostal and caudal. Rostal is ACA, caudal is PCOM and posterior fossa vessels, not PCA. With continued evolution, the ACA supports olfactory lobe, and its perforators supply parts of what becomes basal ganglia. The MCA, in fact, arises as a dominant cortical vessel from a group of ACA perforators (see embryology page, again), which explains some of its variants (accessory MCA types). In the human, the ACOM forms relatively early in a plexiform way, which leads to its many adult variations. Phylogenetically, all kinds of solutions to the ACOM region are seen as “norm” in a given species — from no ACOM to the “azygous” configuration, the same patterns are seen in the human, whose classic ACOM is but one of many possible arrangements. Some variations of the ACA relate to its early supply to the orbit via the ventral ophthalmic artery (see example below) — for example, the infraoptic course of the ACA is persistence of the ventral ophthalmic in setting of “true” A1 hypoplasia. It used to be, that the most common search string leading to this website “hit” was the “Azygous ACA” or some variant of anterior cerebral artery. I am not sure why that was, since there is very little on this site on the subject, and I must say (since I have nothing to sell you) that the subject is not all that exciting for me. I can’t help saying at the outset that the debate on ACA nomenclature is very silly. It’s really quite simple: there are usually two anterior cerebral arteries, with right and left A1 and A2 segments. Sometimes, however, there is only one A2 segment, with no ACOM. Call it what you like; I prefer to say that the “A2 segment is unpaired to the level of…” and leave it at that. Call it Azygous if you like (the Lasjaunias and Berenstein definition of an Azygous ACA is one that is unpared for its entire length — from A1 confluence to the very end, supplying both hemispheres with individual branches arising from a common trunk), but it will invariably confuse some people who have a different notion of what Azygous ACA is. Other silly nomenclature concerns the bifurcation pattern of the ACA. For example, the idea of “triplicated” or “quadruplicated” anterior cerebral arteries — depending on how many vessels emerge from the ACOM complex -2, 3, or 4 — is total nonsense. The right way to look at it is quite simple — the ACA generally has pericalosssal and calossomarginal divisions. Classically, an A2 segment bifurcates into these pericalossal and calossomarginal divisions (with all manner of variations, for example dominant pericalossal or dominant calossomarginal trunks). The length of the A2 segment is variable however — sometimes it is very short or almost nonexistent, so that the periclossal and calossomarginal trunks arise separately from the ACOM region or just distal to the ACOM. 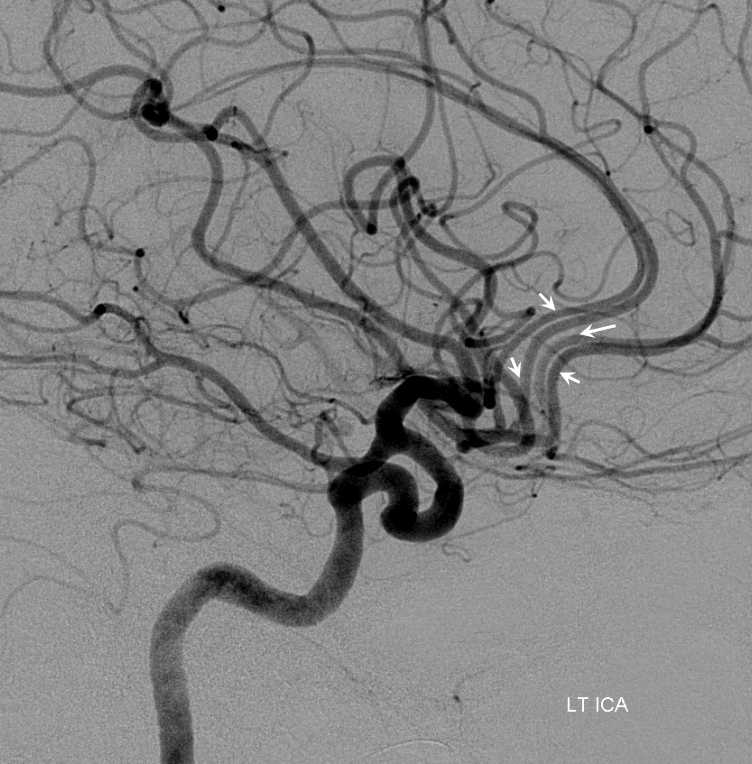 When this happens, it appears as though there are two “anterior cerebral” arteries arising from the ACOM — this is simply an early pericalossal-calossomarginal division. If this happens bilaterally, it may look like an ACA “quadrifurcation”. That’s all there is to it. 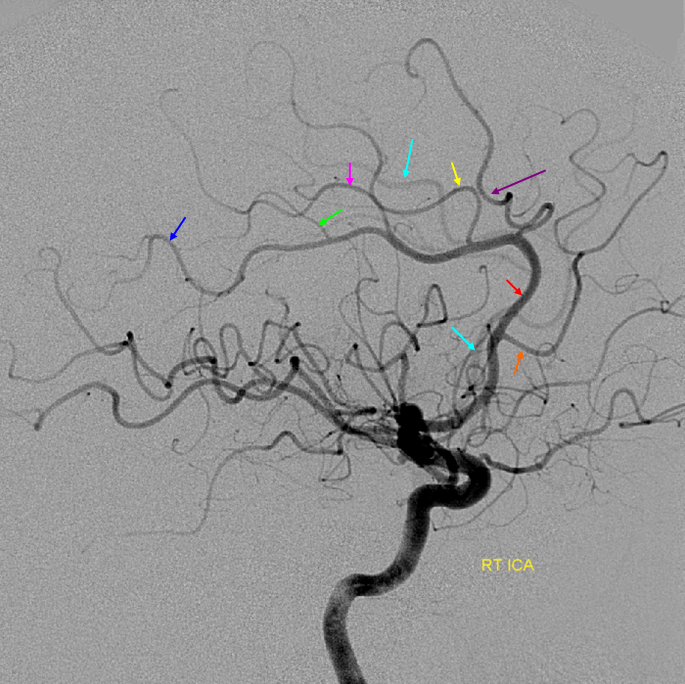 Here is an example of such bilateral early bifurcations on angiography, with 4 branches (2 pericalossal, and 2 calossomarginal) arising from the ACOM region. The more anterior ones are calossomarginal, and the more posterior two are pericalossal, as always. Same patient, stereo pair. The pericalossal division is dominant and supplies the primary motor and sensory areas. The calossomarginal is limited to mesial anterior and mid-frontal regions. Duplicated A1 segment — this is not an uncommon incidental finding. It has a very low increased association with presence of berry aneurysms. On very rare occasion, the optic nerve can go through the fenestration, which implies a very different embryologic pattern from the more common supraoptic fenestration. The fenestration must obviously be kept in mind if surgical dissection is contemplated. A single ACA A2 segment distal to the A1 confluence that never bifurcates again is sometimes called an Azygous ACA, but I think it adds more clarity and simplicity to call it unpaired to the level of whatever (pericalossal, calossum genu, etc). There is no ACOM, by definition. The incidence is about ~0.1-1%, depending on the author. Embryologically, its significance is unclear. Phylogenetically, it is the “normal” disposition in some monkeys and other mammals. There is a resemblance to the vertebrobasilar arrangement, but it may just be a resemblance only. You may think of it as an ACOM gone berserk, but that’s probably wrong also. This disposition carries a strong association with aneurysm formation at the terminal end of the unpaired segment, or at the calossomarginal takeoff region, as illustrated below. “Triplicated ACA” Another potential source of costly error is established when a classical “normal” appearance of the bilateral A1 and A2 segments is associated with early takeoff of the the frontopolar branch from the Anterior Communicating Artery. The resulting apperance (see below) can be erroneously interpreted as three A2 segments with 2 Anterior Communicating arteries. Indeed, there are three vessels arising at the ACOM, but one of them is a frontopolar branch, not an A2. Should an aneurysm arise in this region it is critical to understand this anatomy; otherwise the surgeon, coming upon what appears to be the contralateral A2 without realising that the true A2 is yet deeper into the surgical field, may think that the ACOM has been fully explored. In fact, if the aneurysm arises from the ACOM segment distal to the frontopolar branch, the surgeon will not see it and may back off before reaching the true A2. 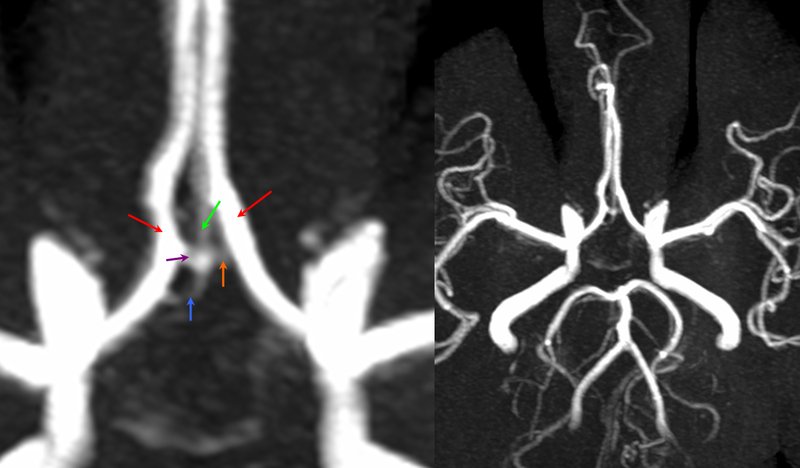 MRA MIP images demonstrating the so-called “ACA triplication” which is in fact a normal disposition with two A2 segments (red) and a smaller frontopolar branch (green) arising from the ACOM (purple and orange). This can be erroneously interpreted as having two ACOMS when there is truly one. Also present is an inferior branch (blue) going toward the region of the optic chiasm. Triplicated ACA — angiographic pitfalls. 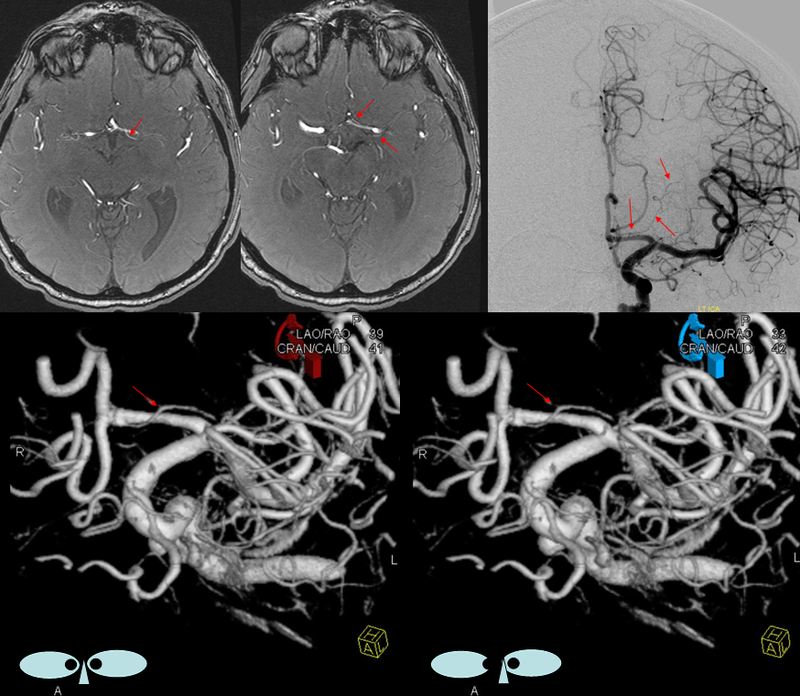 Angiography of the ACOM region can be challenging, for many reasons. This is one of them. 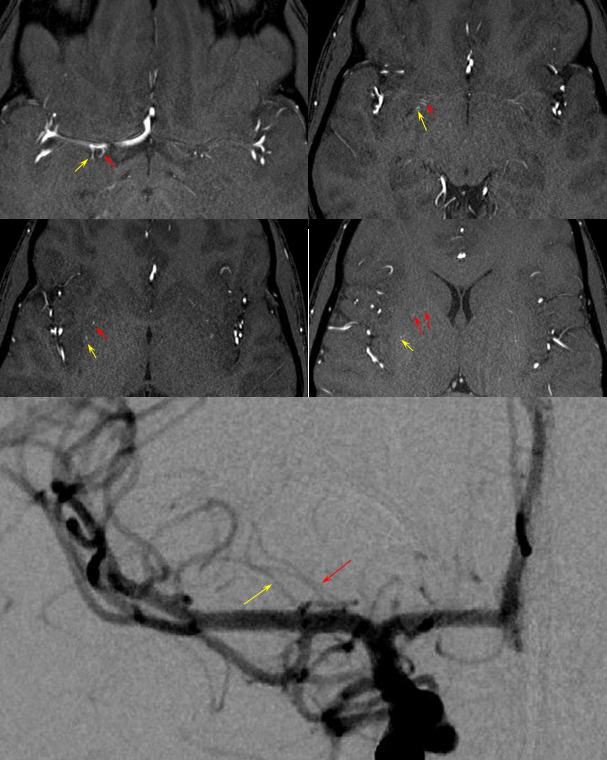 A cursory view of the left and right CCA injections below (top row) may lead one to believe that a normal disposition of two A2 segments exists with a robust anterior communicating artery. A stronger right CCA injection however shows that in fact 3 vessels emerge from the ACOM region, not two! Since all three vessels are difficult to opacify from a unilateral injection, one may arrive at an erroneous conclusion as to the ACOM region anatomy. 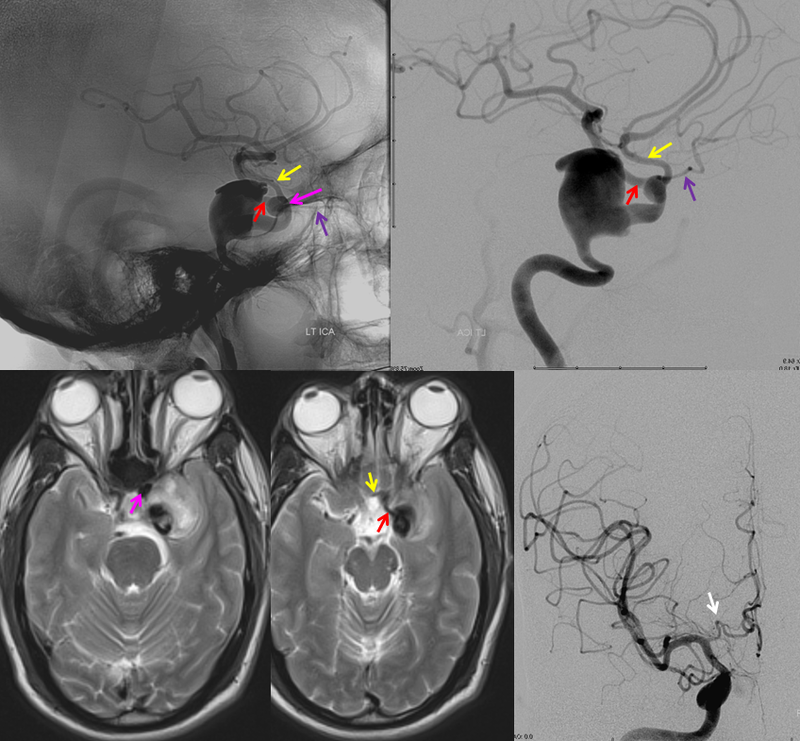 Right CCA injection on the bottom left and MRA on bottom right of the same patient, in fact, show an early bifurcation of the right ACA into calossomarginal (purple) and pericalossal (red) branches. on the left, a single A2 (yellow) is present, thereby giving a false apperance of “triplication”. The true ACOM is shown in dark blue, whereas the “false” ACOM (a projectional illusion since the right calossomarginal arises from the ACOM region) is marked in light blue. The left A1 reflux is marked in pink. 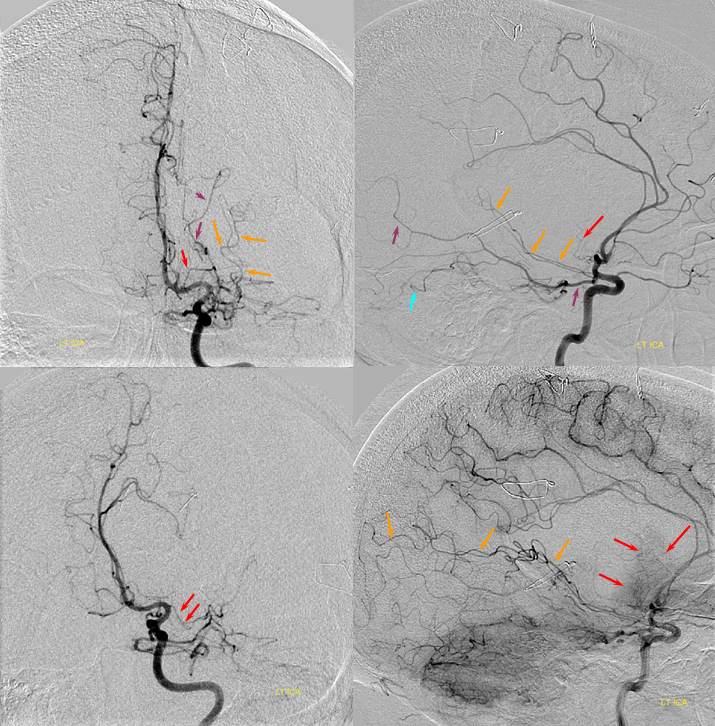 The same patient in lateral with early calossomarginal takeoff (purple) and pericalossal in red. The same MRA image as above. This is a well-known disposition. There are all kinds of fenestration patterns. It is one of the few things that can be tricky to evaluate angiographically because of competing inflow from the other side. It can be also difficult to recognize a fenestration on standard angiographic projections. 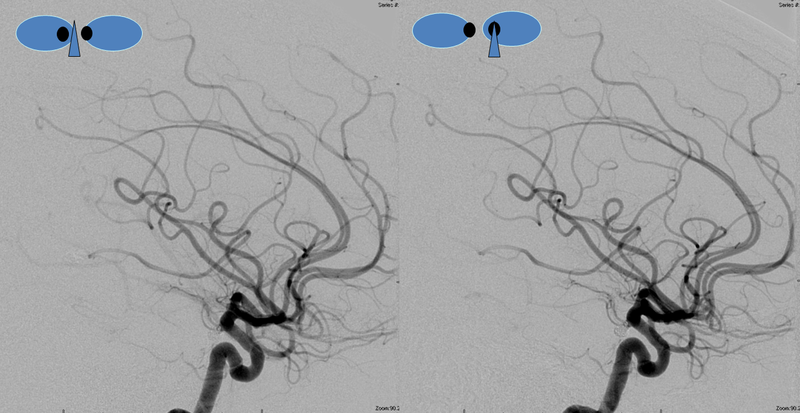 Caution is highly advised also when evaluating ACOM region on rotational / 3D angiography as competing inflow can result in all kinds of fake-outs (like A1 cutoff looking like an aneurysm). High-quality MR and CT do a very nice job with fenestrattions. Much can also be achieved from the under-utilized tool of high-end MRA post-processing. Usually standard volumetric images generated on the MR console are all that is made. However, independent workstation high-end post-processing can be much better. Here is an ACOM seen on standard views, in stereo, of a patient with carotid dissection. There is a fenestration and an early calosso-marginal branch. Asymmetric A1 — there is often asymmetry, with dominant A1 segment on one side and a hypoplastic one on the other side. Usually this leads to asymmetry in the size of the carotid artery as well, which sometimes generates confusion as regads potential dissection or long segment stenosis. Notice that the right ICA (purple) is larger than the left (yellow) since the left side also supplies both ACA territories thru a dominant left A1 (red). A relatively rare but very important variant, which illustrates key developmental aspects which also concern the ophthalmic artery. In early embryonic development, orbital structures are supplied by two vessels, both of which do not originate from the “adult” location of the ophthalmic. Instead, a dorsal ophthalmic artery arises from the region of future ILT, and second ventral ophthalmic artery extends from the anterior cerebral artery (ACOM region), underneath the optic nerve, and through the optic canal into the orbit. 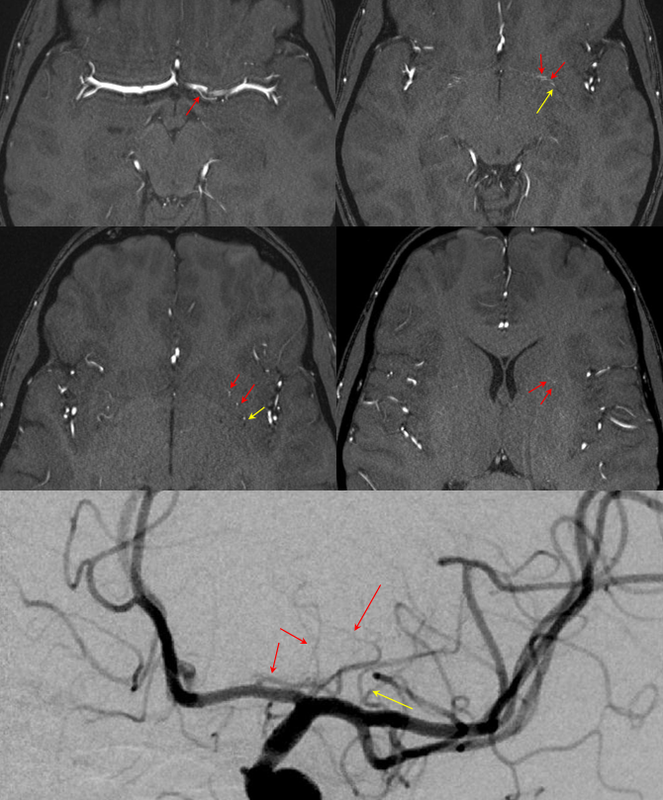 Occasionally, the dorsal ophthalmic artery persists, with several examples shown in the ophthalmic artery and ILT sections. 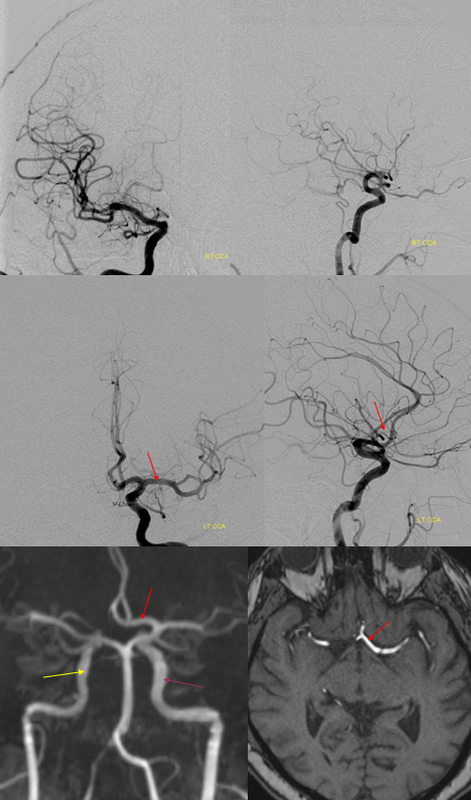 Extremely rarely, the ventral ophthalmic artery can persist as well. More commonly, however, the ventral ophthalmic artery conduit persits as the “A1 segment” of the ACA, as in this case, and takes an infraoptic course. It appears as though the ICA bifurcated early — at the ophthalmic segment — such that everything distal to the “early” ICA bifurcation may be percieved as the MCA — implying that both PCOM and A. Choroidal arise from this M1 segment. This, of course, is an incorrect interpretation — in fact, the “classical” A1 segment is developmentally hypoplastic, and is compensated by its collateral ventral ophthalmic conduit, which functions as the A1 segment, such that both PCOM and A. Chor. arise exactly as they should, and the M1 segment is defined as the vessel distal to the choroidal. 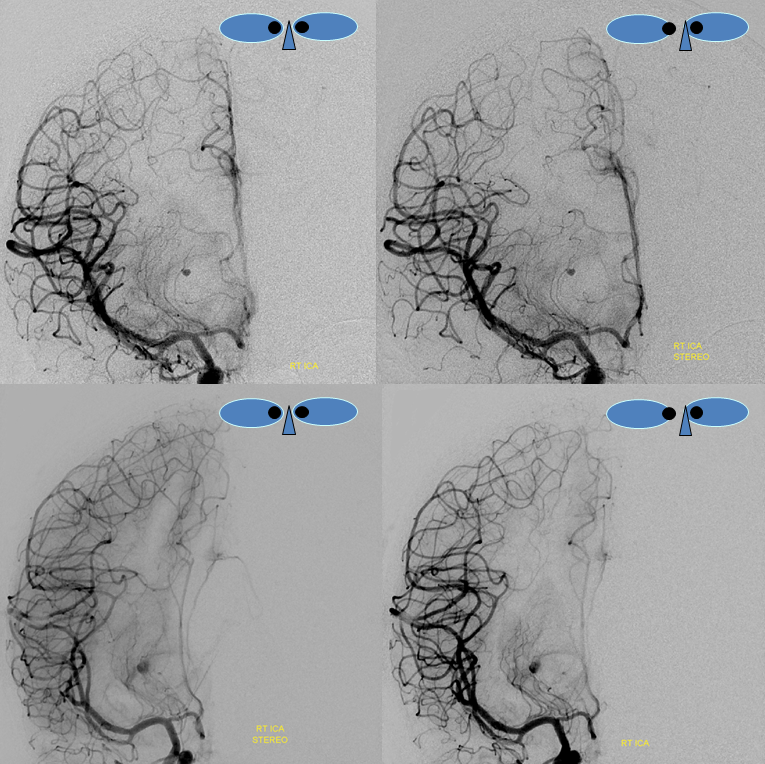 Angiographic and MRI images demonstrating a giant, partially thrombosed cavernous segment aneurysm in association with “early takeoff” and infraoptic course of the left ACA (yellow). MCA is red. 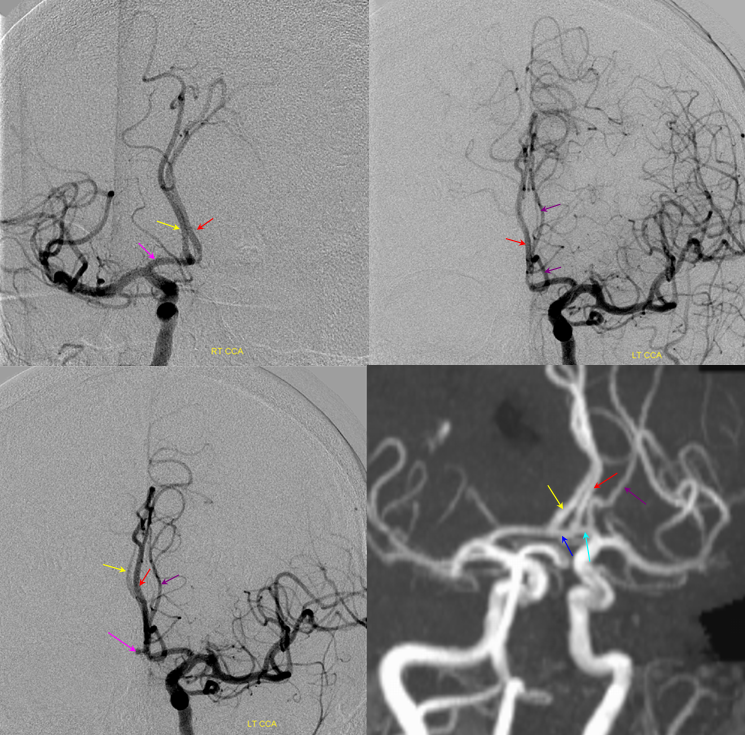 A second aneurysmal dilatation (pink) at the trifurcation of the ICA, ACA, and ophthalmic artery (purple) is present also. Frontal projection of contralateral right ICA injection shows redundant course of the right A1 segment (white arrow), which should be recognised as a distinct anatomical variant in bilateral A1 segment development, correlating with the more obvious issues on the left side. 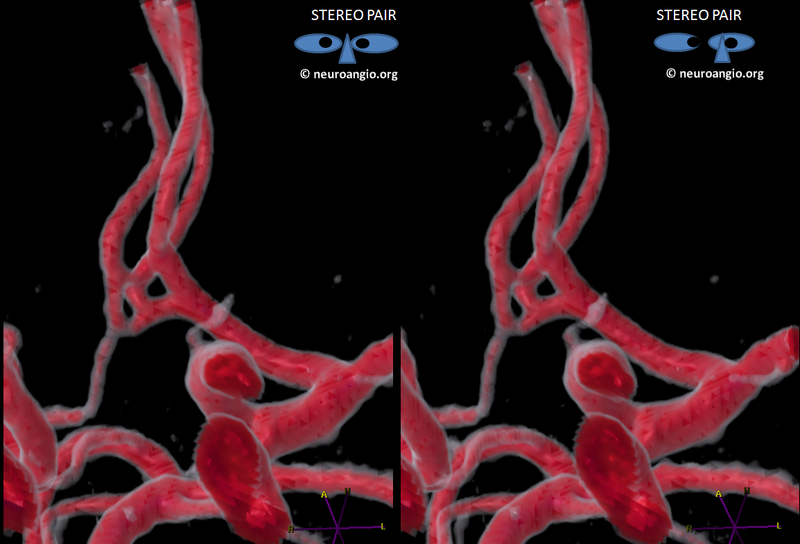 Stereo pair of rotational volumetric dataset in the same patient. Notice normal location of the anterior choroidal artery, once it is understood that the vessel distal to ACA takeoff and proximal to the choroidal is still the ICA, not an M1 segment. 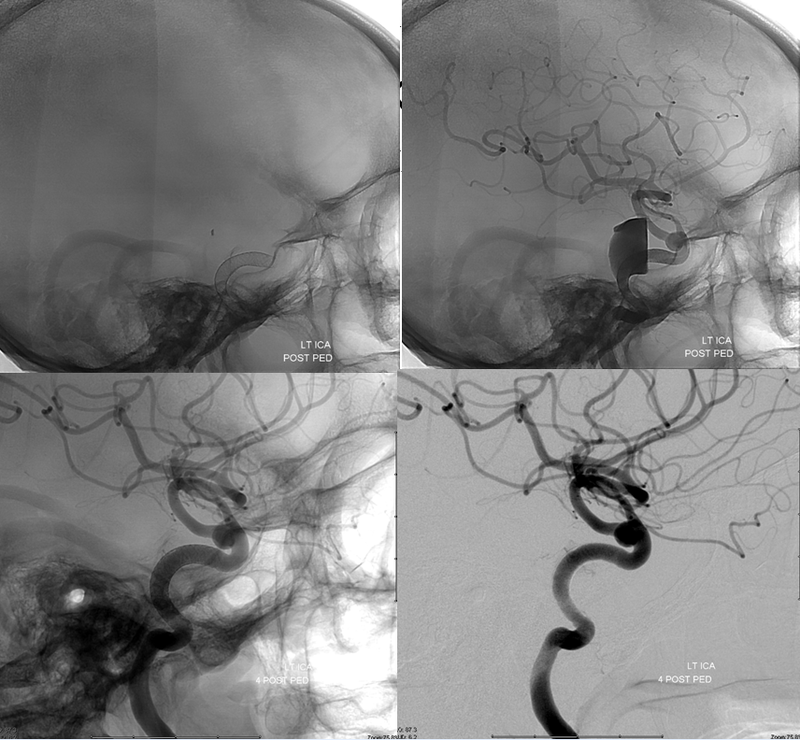 Top row lateral DSA immediately post Pipeline embolization of the cavernous segment aneurysm. Bottom row 4 months post embolization shows cure of cavernous aneurysm. The anterior choroidal artery is well seen. Famous artery. Usually comes off the A1 or on occasion A2 or ACOM. “Recurrent” because it goes “back” laterally along the A1 segment towards the terminal ICA, so it often looks like a small artery running alongside and above the much bigger A1. 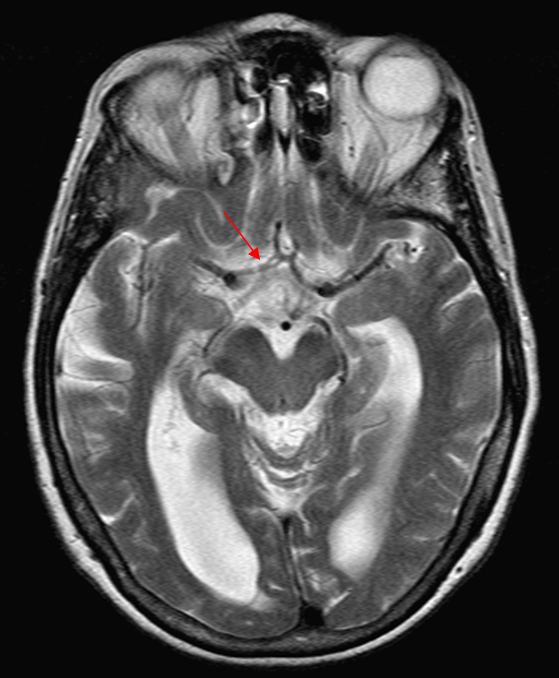 It is simply one of the larger medial perforator arteries arising from A1 and M1 segments to head towards the basal ganglia. It happens to be usually conspicuous and therefore has proportionally larger surgical and endovascular implications to preserve it. It is also instructive in terms of MCA embryology — cases of “MCA duplication” are often not MCA duplication but a particularly large Heubner which supplies much of the basal ganglia and sometimes cortical territory, and therefore looks like another ICA. Going back to amphibians and fishes, where an MCA-like vessel is first recognized, it turns out that MCA develops from coalescence of multiple smaller perforator-type vessels which assume prominence with phylogenetic enlargement of the brain volume to capture cortical surface territory. It is not difficult to conceptualize that on occasion instead of a single MCA trunk, two vessels may develop to “split” the MCA territory, thereby earning the name of “duplicated MCA”. The other “MCA” is usually another perforator-like vessel, i.e. Heubner. As with any vasuclar arrangement, the size of the Heubner will vary depending on development of collateral vessels to the same area — it will be small when other medial perforators are well-developed, and vice versa. Same patient, DSA stereo. The spasm is due to a ruptured, coiled choroidal aneurysm. The dissection predates everything. Another example of RAH. 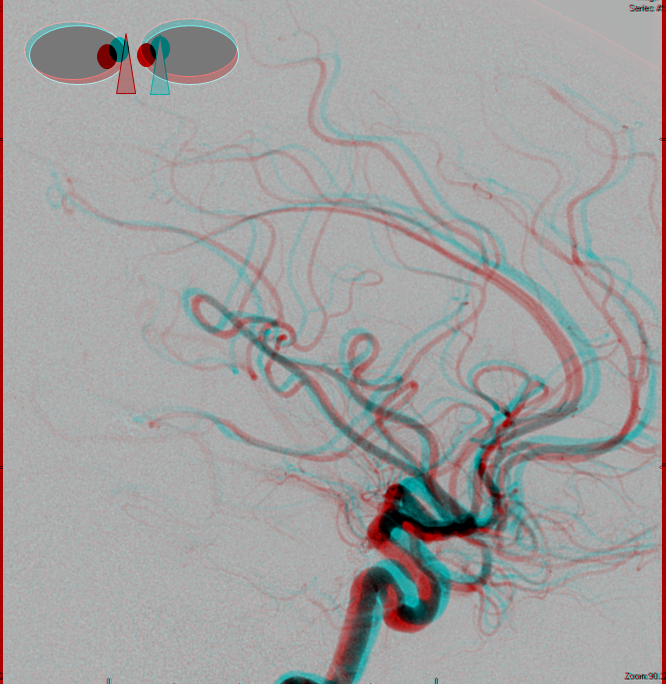 MRA, catheter angiogram, and 3-D DSA stereo pair demonstrating the same artery of Heubner. Again, 3-T MRA is very nice for small arteries like Heubner. This is a very clear demonstration that Heubner and medial perforators off the MCA serve the same function. In this patient, a large Heubner on the left serves the same function as the medial M1 perforators on the right, supplying the putamen, caudate, and parts of the anterior limb of the internal capsule. 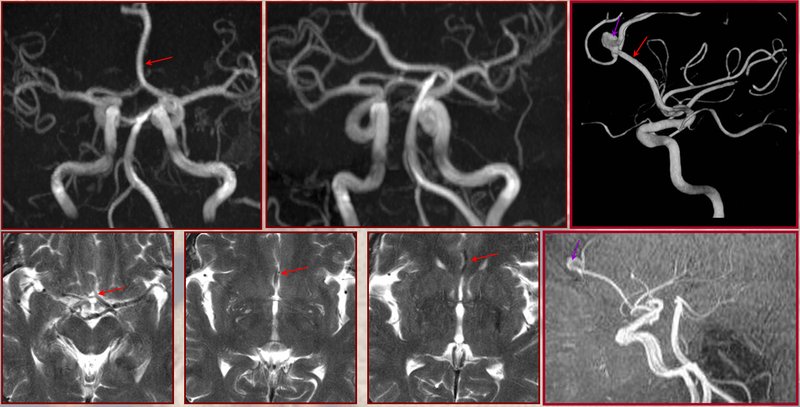 Heubner in patient with no MCA — the anterior choroidal artery and Heubner artery are well seen in this patient, whose MCA was surgically removed in context of a left hemispherectomy for intractible seizures. The anterior choroidal, which appears duplicated, captures some of the posterior temproal/occipital territory. The heubner and its basal ganglia parenchymal blush are well seen. 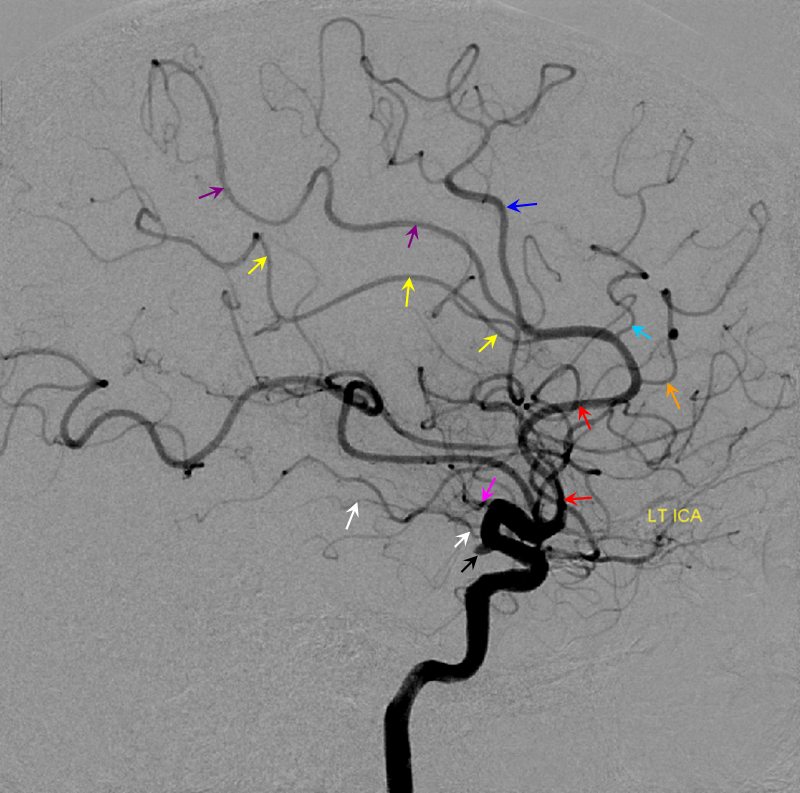 Red = Heubner; Orange = Anterior Choroidal; Purple = PCA; Blue = distal superior cerebellar artery visualized through reflux into the basilar. RAH pseudoaneuyrsm — a case of parenchymal hemorrhage from a RAH. The CTA demonstrates a “spot sign” (red) which, within a hematoma, is strongly suggestive of source of bleeding (active or pseudoaneurysm). No delayed images were acquired, unfortunately. Angio (middle) demonstrates the aneurysm. 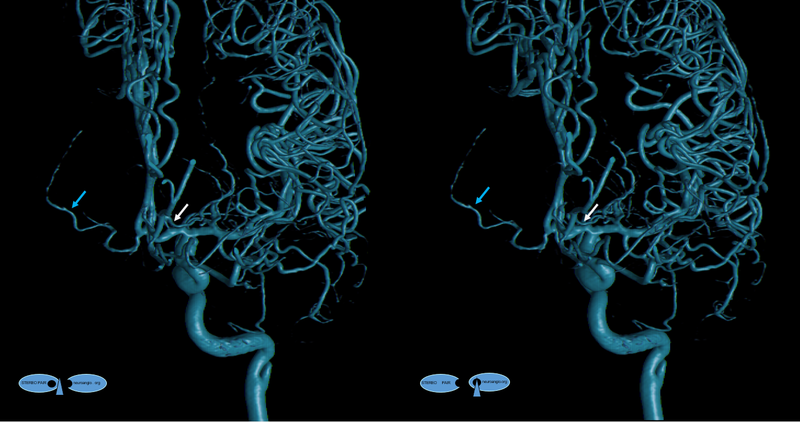 Intraoperative angiogram (right) following aneurysm surgery. 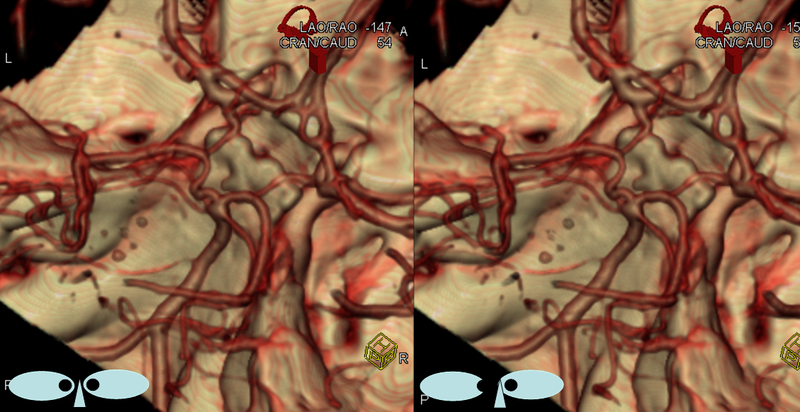 Stereo pairs of same case 1 week (top) and two weeks (bottom) following hemorrhage, demonstrating interval aneurysm growth — in fact showing an enlarging pseudoaneurysm in face of resolving hemorrohage. The patient was operated on after the second angiogram. 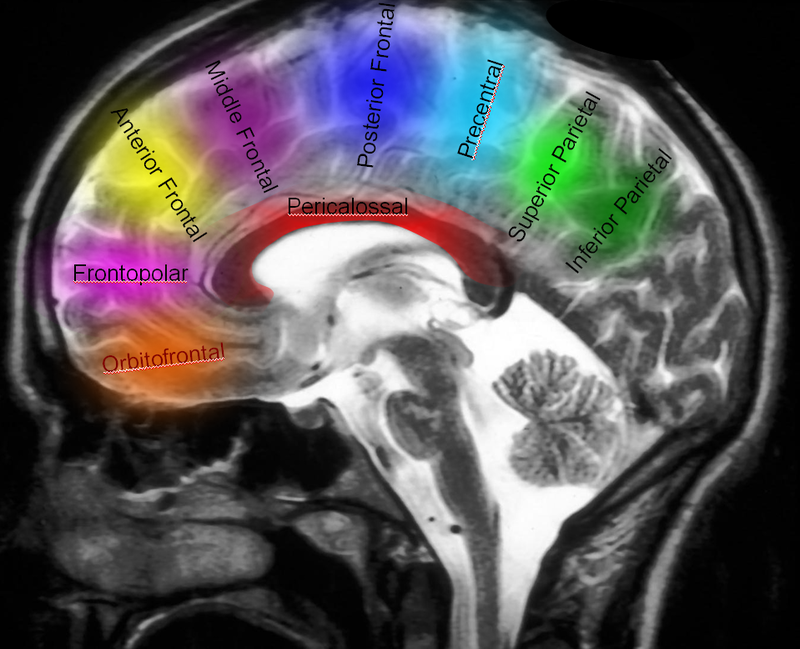 Naming scheme for cortical ACA branches — no educational endeavor is complete without a silly diagram like this. Extreme variability is the rule. As long as there is understanding of where the artery is going to, naming is a matter of semantics. Naming classifications are variable, this one is as reasonable as any other. Examples of variability are given below. 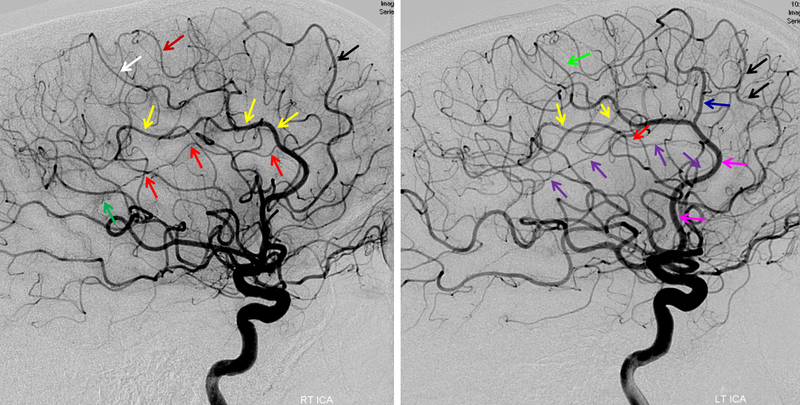 Dominant Calossomarginal Artery — another example of variability in the pericalossal-calossomarginal balance. 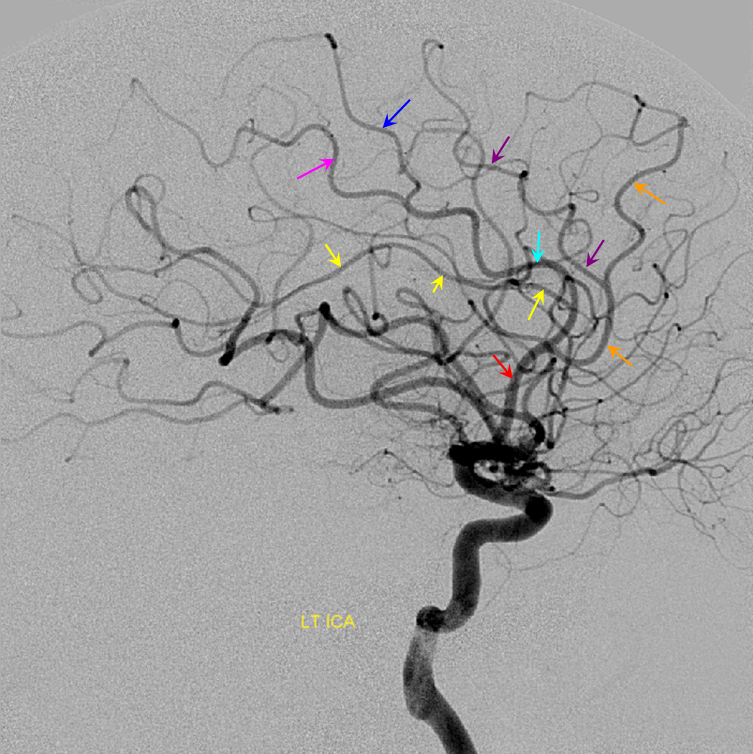 Lateral projection angiogram with early calossomarginal takeoff (purple) and pericalossal in red. 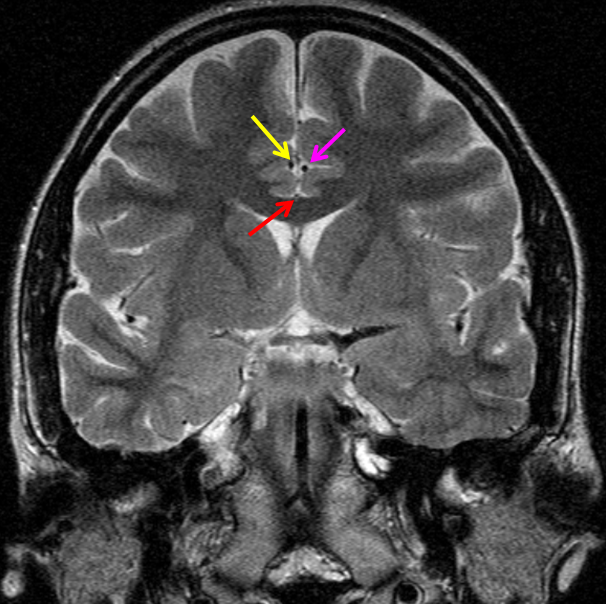 Corresponding MRA image with left A2 shown in yellow and ACOM in dark blue. This is the appearance of a “triplicated ACA” which is discussed above; it is a misleading term since not 3, but 2 ACA arteries are present. It is the A2 segment on the right that’s absent because of early bifurcation into calossomarginal and pericalossal. 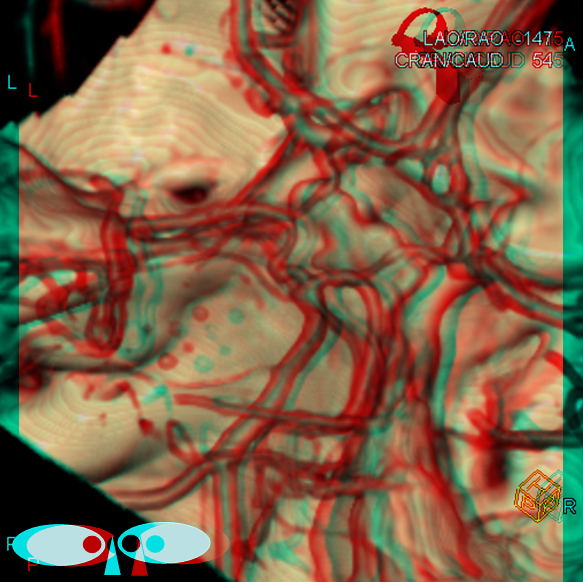 Trifurcation, on a mini scale — a small frontopolar artery (red) is seen to originate from the ACOM complex in this stereo view. PCA (particularly posterior pericalossal / splenial branches can effectively reconstitute distal pericalossal ACA territory. Embryologically this corresponds to a PCA/ACA anastomosis which exists in some mammals and possibly in the human embryonic stage. Carotid Occlusion — PCA reconstitution of the ACA territory.